I love chatting with Kevin! And this year was extra special as it was Sonoma International Film Festival’s 20th anniversary. I don’t normally podcast event interviews, but we touched on so many things about the festival that I do want to share this one. Happy birthday, SIFF! Here’s to another 20 years of Sonomawood! To find out more about upcoming Sonoma International Film Festivals, keep an eye on the website, Facebook, and Twitter. To search comments on year’s past, simply use #SIFF plus the year. For example, this year was #SIFF17. SONOMA, CA (April 3, 2017) – The Sonoma International Film Festival (SIFF) is pleased to announce the Jury Award and Audience Award winners from the 20th Anniversary celebration of film, food, wine and spirits this past Wednesday, March 29 to Sunday, April 2, 2017. Highlights from the most attended festival in it’s 20 year history include the Backlot Tent themed parties, the Q & A with Angela Sarafyan of The Promise on Opening Night, and the overflowing reception at the Zina Lounge at the Ledson Hotel for In Search of Fellini with critic Leonard Maltin and writer Nancy Cartwright and actress Maria Bello. The Film Jury Award winners of the 20th Annual Sonoma International Film Festival were announced Saturday evening during the Red Carpet Celebration in the Backlot Tent. 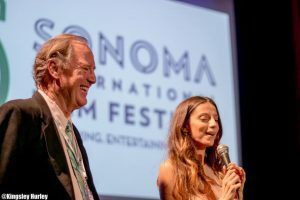 The Audience Award winners of the 20th Annual Sonoma International Film Festival were announced yesterday evening in the SIFF Village Backlot Tent, amidst the hubbub of the festival’s Closing Wrap Party.